There's a haunting and strangely beautiful quality to Toronto's abandoned and derelict places that makes for fantastic photography. 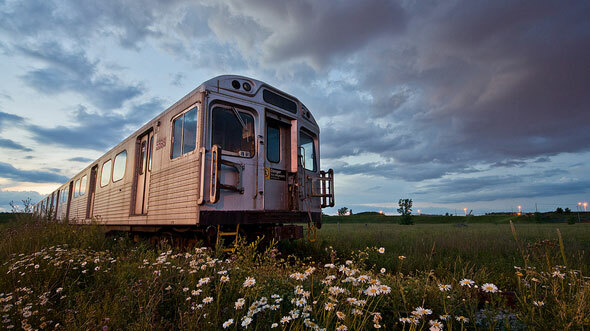 Maybe it's due to the faded signs of life, and the grass and wild flowers slowly reclaiming the man-made objects, or maybe its the sense of silence and privacy. 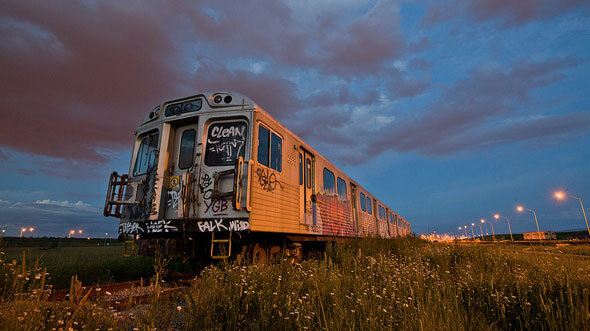 Snapped a few days ago at sunset by photographer Peter Muzyka and uploaded to the blogTO Flickr pool, these graffiti-covered and seemingly mothballed TTC vehicles near the commission's Wilson Subway Yard do, apparently, serve a purpose. "I was going through Downsview many, many times and I always saw those objects from far, far away and I wasn't sure what they were at the time until someone mentioned it," explains Russian expat Muzyka. 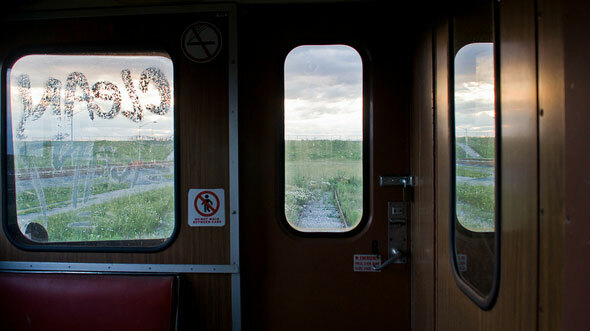 "You can see them from the window of the train [between Downsview and Wilson]." To get inside the fenced-off area, Muzyka sweet-talked friends at the Wilson yard into letting him inside for a few hours while they performed maintenance. 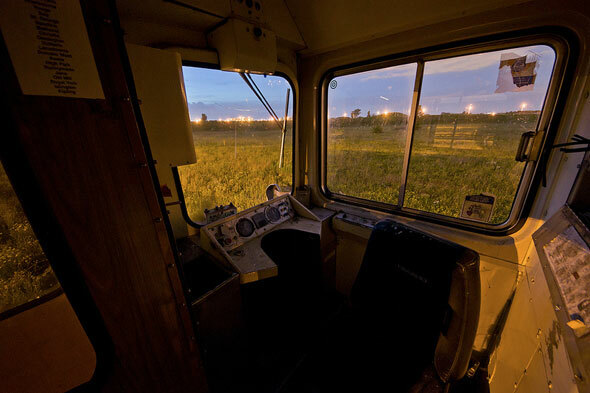 Though technically part of the complex, the field containing the vehicles is actually some distance from any active tracks. 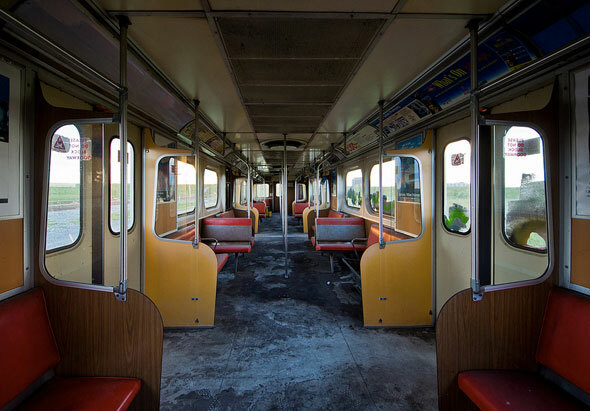 "It was quite surreal because usually you don't see a train or bus in that kind of setting. Usually you see them in concrete with people around and all that. Here, it was quite a contrast because you see them in a really beautiful field. There were lots of different flowers there, such as camomile flowers, and the bus was basically sinking in this tall, beautiful grass." According to Brad Ross, executive director of corporate communications at the TTC, the H2 H4 series subway cars and city bus are used by Toronto Police Service for training exercises, though the undisturbed brush around the vehicles suggests no-one has been by for some time. Inside, a thin layer of gray-white dust coats the seats and floor. Muzyka estimates the cars last saw use in 2001, gauging by dates on promotional material left inside. The last H4 subway train made its final ride on the Bloor-Danforth line in January of this year. "It was quite nostalgic for me because I actually came to Canada in 2001. It was like they were taken from the past and frozen in time."